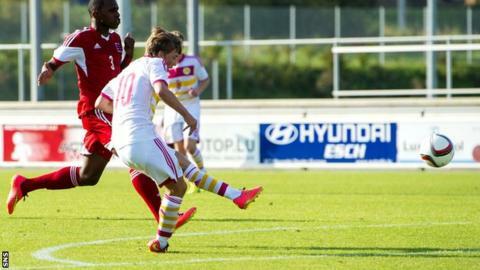 Sporting Lisbon forward Ryan Gauld grabbed two goals as Scotland Under-21s won 3-0 away to Luxembourg in European Championship qualifying. Rangers midfielder Lewis Macleod was also on target for Billy Stark's side, whose bid to reach the finals in the Czech Republic was already doomed before the match. A 1-1 draw in Slovakia sealed Scotland's fate. Stark's side ended the campaign third in Group Three. Gauld - who joined Sporting Lisbon in a £3m summer deal and was last week named in the club's Champions League squad - opened the scoring after 31 minutes at the Stade Municipal de Differdange, curling home after fine play from Stevie May. Sheffield Wednesday hitman May then sent a free-kick just wide before Macleod added the second 10 minutes before half-time when he finished off a sweeping move that also involved Gauld and Aberdeen defender Ryan Jack. Gauld's second came on 62 minutes as he swept home after neat work by Ryan Fraser, while the 18-year-old just missed out on a hat-trick with 10 minutes left after Luxembourg stopper Joe Frising did well to save his low shot. Slovakia beat the Netherlands 1-0 away to finish top of Group Three and reach the play-off round.